The 2019 Chevy Camaro is a vehicle that will impress you at every turn. Whether it be the impressive safety features, the low MSRP, or anything in between, you’ll be amazed by what this vehicle has to offer. If you’re looking for a vehicle that looks like you spent much more money on it than you actually did, you’ll love the 2019 Chevy Camaro. This vehicle is much more than just a sports car. In fact, it has a plethora of features that will prove to you that it’s a vehicle that can’t be contained into just one category. If you’re in the market for a new vehicle, make it a priority to view what the 2019 Chevy Camaro has to offer. This car is immensely powerful, especially for a vehicle of its size. If you’re interested in a vehicle that will be able to handle whatever you throw its’ way, it’s time to see what the 2019 Chevy Camaro has to offer. Even if you’re not looking for a new vehicle for its power and capabilities, you’ll love what the 2019 Chevy Camaro is able to accomplish. This car can get up to 455 lb-feet of torque and an impressive 455 horsepower. Due to the fact that this vehicle is a compact car, these specs are insanely impressive. You’ll never find yourself in a situation where you can’t handle the roads ahead. In fact, with the 2019 Chevy Camaro you may even go looking for adventure. If you’re interested in driving a vehicle that has your ultimate safety and security in mind, you’re going to love driving the 2019 Chevy Camaro. The Rear Vision Camera will make backing out of difficult driveways and parking spaces a breeze. You’ll never have to worry about accidentally causing an accident due to a blind spot with the Lane Change Alert and Side Blind Zone Alert features. There are countless reasons why the 2019 Chevy Camaro is superior to other vehicles in its class. However, by and large, the safety features set it apart from the rest of the crowd. If you value you and your family’s safety and security, it’s time to see what the 2019 Chevy Camaro has to offer. You won’t be disappointed. As if the power and safety features weren’t good enough, the MSRP for the 2019 Chevy Camaro is absolutely desirable and will blow you away. Based on the sheer amount of features and capabilities it has, one may be lead to believe that the MSRP would be on the higher end. The MSRP for this car is $25,000 at the base model, which is impressive to say the least, especially due to the fact that you could pay more for a vehicle that has far fewer features and capabilities than this one. If you’re interested in saving money on a monthly payment and driving a vehicle that exceeds all of your expectations, you’re going to love the 2019 Chevy Camaro. These features speak to the fact that you’ll be able to traverse a variety of terrain with the 2019 Chevy Camaro. You’ll never need to worry about your safety being compromised, even in the most difficult situations. Whether you’re looking for a vehicle that will take you on all of life’s great adventures, or just a vehicle to get you from Point A to Point B, you’ll be happy to have the plethora of safety features that are offered through the 2019 Chevy Camaro. All of these features will provide you with the confidence that you need to be an informed and safe driver. Whether you’ve been driving for 3 years or 30 years, you’ll be happy to have those packages to keep you protected and safe on the roads. When it comes to purchasing a vehicle, the MSRP is immensely important. Obviously, you don’t want to end up falling in love with a vehicle that you aren’t able to afford. Furthermore, you want to ensure that you’re getting a good value for the price that you’ll be paying on a monthly basis. With the 2019 Chevy Camaro, you’ll be happily surprised by the sheer amount of features and capabilities that come on the standard base model. This is perfect for those who don’t wish to have a lot of upgraded features, and still want the Chevy Camaro parked in their driveway. Furthermore, this is perfect for those who don’t have an expendable income that will allow them to pay an outrageous amount on a monthly payment. The MSRP for the standard base model is $25,000, which is impressive. Simply by walking the aisles of your local dealership, you’ll find vehicles that are priced higher than that, which come with far fewer features and capabilities. 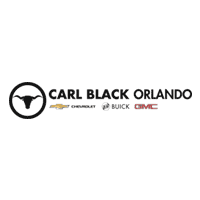 Carl Black Orlando is the place to shop for your next vehicle. If you’re local to the Orlando area, you know just how many options are available. If you’re looking to limit the options, start with which dealers will offer exemplary customer service. Many will claim to offer excellent customer service but will only leave you disappointed with lackluster service. Many dealerships will make you feel pressured into purchasing a vehicle that you’re not truly in love with. Skip the games with Carl Black Orlando. Instead of feeling the pressure and unnecessary hassle, you’ll be met with respect and tolerance throughout the entire process. If you’re not sold based on the fact that Carl Black Orlando provides the best customer service in the Orlando area, you’ll surely be impressed by the sheer amount of vehicles that they have to offer. Whatever you’re looking for you’ll be able to find at Carl Black Orlando. What’s even better? You’ll be able to find it listed at the best possible prices, which will be sure to excite you. If you’re looking to save money on your next vehicle, it’s time to see what Carl Black Orlando can do for you. You won’t regret it.